I had been wanting to find and cook a puffball mushroom for some time. It was something in the back of my mind but which I’d not actually pursued....until now. This is it: the year of the puffball! Strangely, as soon as I determined to find my puffball, they started cropping up everywhere - in conversation at least. One friend sent me a picture from an afternoon hike: “What is this?” she asked, and after getting my answer took it home. Then, my physiotherapist showed me a giant absurdity that her coworker had brought in for her: “A puffball!” I exclaimed. She was surprised I knew what it was, never mind that I was in hot pursuit of one myself; she quickly tucked it away. Feeling hopeful from these inspiring finds, my hunt began. I was looking for the giant puffball, Calvatia gigantea (aptly named). I’d read that in Ontario, hardwood forests were the best bet for finding them, whereas in the United Kingdom, meadows seemed the place to look. I started with the forests, and since I enjoy a good hike, it was hardly a task. The key to good puffball eating is to get ‘em while they’re young. A choice specimen is white all the way through with a nice, fleshy, marshmallow-like interior. The mushrooms have no gills, and if you find gills when you cut it open, it’s not a puffball and could be deadly. If it has gone green or brown, inside or out, leave it. Though it won’t kill you, it will taste like cardboard and could give you an upset stomach. Anyway, the ripe, brown puffballs are much more fun to kick! They explode on impact, releasing billions (or trillions!) of spores - all the better for next year’s hunt and harvest. 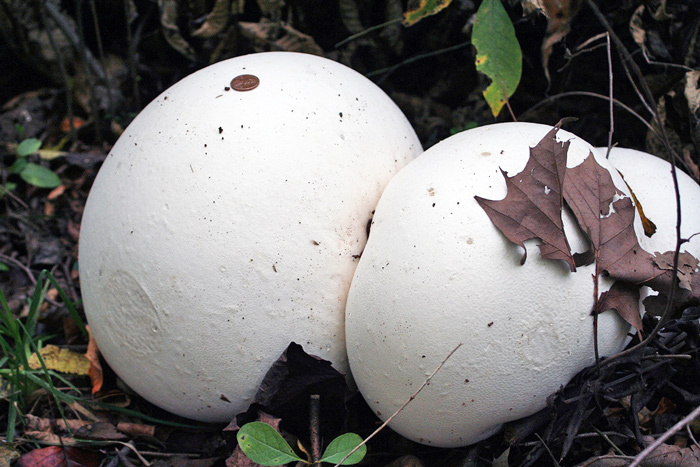 Puffballs generally grow from 10 to 70 centimetres in diameter, although monstrously-sized ones measuring over a metre in diameter have been found. They are smooth (apart from superficial damage) and round, though of course nature does its thing and some turn out more oblong. They don’t grow on a stem like most mushrooms (what stem could support that?) and although mycologists don’t recommend eating mushrooms you find in the wild unless you’re an expert yourself, a puffball is pretty unmistakable. Still, if you’re unsure, you should always find an expert to confirm your identification. Salivating as I hiked I imagined slices of puffball covered in batter and fried in garlic butter. I am a big fan of mushrooms, cooked any which way, and I was keen to add a native, hand-picked one to my taste list. After a couple of weeks, I began to despair of ever finding one. I was looking in the right places and in the right season, and yet I could find not a one. Trail after trail proved fruitless (fungiless?) and after hearing of friends’ successes, I wondered what I’d ever done to so upset the fungi gods. I wandered off trails (a hiker no-no); I visited a variety of habitats from hardwood forests to meadows; I begged a friend for a piece of her precious find: “Too late, already consumed,” was the reply. “What did it taste like?” I asked. Although I’d heard them compared to tofu, I’d also read of rich, nutty flavours. My mushroom-loving taste buds ached to find out for themselves! I phoned the local health food store but to no avail, and as I sit here writing I remain puffball-less; sans puffball; puffball deficient. But I will not lose hope! I will find my very own puffball, I am resolute. I know what will happen: tomorrow I will go out and stumble across one purely by accident, and that’s okay by me, better late than never. Meanwhile the batter, butter and garlic sit on standby. Laura spent her youth hunting for bog monsters with her family on annual camping trips. She is steadfast in her determination to abolish people’s unjust aversion to snakes, and writes and talks about them frequently. She is fond of the letter J, which is the tenth letter of the alphabet (the total number of years Laura has lived in Guelph) and is the first letter in Jack-in-the-Pulpit, Laura’s favourite native plant.